The mountain stages are where the Tour de France gets serious. The major contenders for podium places in Paris come out to play. To win this legendary race you have to be an expert climber as it in on the final hill climbs that the best are able to put time between themselves and the chasing pack. 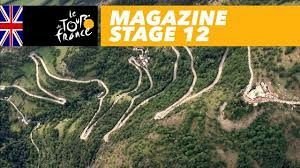 Yesterday, the finish on Stage 12 was at the top of the legendary Alpe d’Huez and at the start of this final of the three major climbs, the top riders were 4 minutes down on the leader with 13.7 km to go. On every final climb there are thousands of spectators cheering, clapping, waving flags and generally willing the riders on. However there are always idiots, usually young men who have had far too much to drink while waiting for the bike riders. They often run alongside the riders, sometimes wave flags in their faces and this year let off coloured flares. In years gone by there have been accidents in these situations: Lance Armstrong once caught a plastic bag on his handlebars and toppled off, and a Frenchman leading a climb collided with a spectator taking a picture about 2km for the finish. Fortunately he got back into the saddle and won the stage. Occasionally it gets nasty and there is plenty of booing. 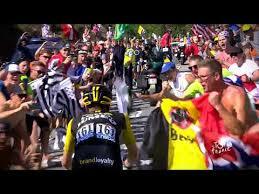 This year one spectator tried to push Englishman Chris Froome off his bike. The defending champion is not popular in France because he was recently cleared of a drugs charge after testing positive in the last year’s Vuelta a España for Salbutamol; a drug used to treat and alleviate the symptoms of asthma. Many feel he should not have been allowed to race this year’s Tour. A previous winner, Italian Vincenzo Nibali, did come off his bike on yesterday’s Alpe d’Huez climb as spectators crowded in from both sides. On the Alpe d’Huez zigzag switchback the top riders caught the leader with a few kilometres to go and Froome went ahead. 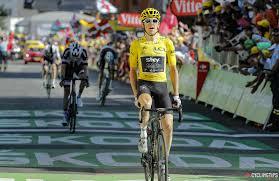 However, others caught up, including SKY teammate Geraint Thomas, and they formed a select group of four. Fortunately over the last kilometre or so there are barriers to restrain the crowd, so there is no interference for the cyclists. 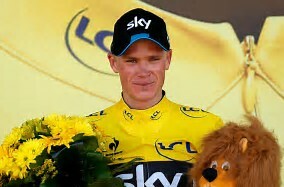 Thomas had won Stage 11 on La Rosiere on Wednesday and did it again on Alpe d’Huez to retain the coveted yellow jersey. He is now 1minute 39 seconds ahead of teammate Froome, but he insists that he is riding for the SKY number 1. Slovak, Peter Sagan, has a huge lead in the sprinters’ green jersey competition and Frenchman, Julian Alaphillipe, is still ahead in the contest for the King of the Mountains polka dot jersey. After three tough days in the French Alps today’s stage is a relatively flat one as the riders head across southern France to the Pyrenees where more mountain await.